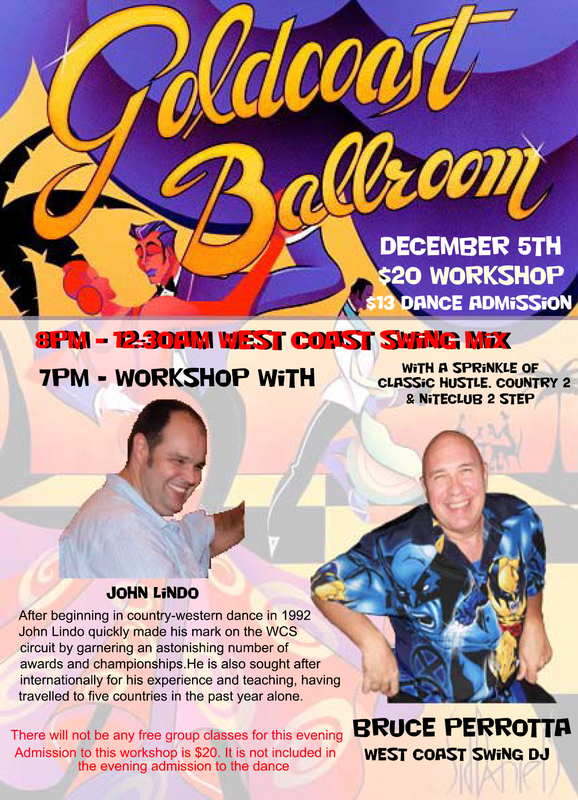 Special West Coast Swing Night – December 5, 2014!! Featuring Workshop with John Lindo, National WCS Champion!! West Coast Swing Mix with DJ Bruce Perrotta!! Featuring a Workshop by Champion John Lindo!! Exciting West Coast Swing Mix with DJ Bruce Perrotta!! Special WCS Workshop by Visiting National WCS Champion, John Lindo!!! Don’t miss our Special West Coast Swing Night – December 5, 2014!! Join Goldcoast in welcoming John Lindo to town! Before the Dance, John Lindo will teach a Special Intermediate Level Workshop on West Coast Swing – from 7:00 PM – 8:00 PM. The cost of the Workshop is $20.00 per person (this does not include admission to the dance, which is priced separately at $13.00* for the entire evening). At 8:00 PM, Bruce Perrotta will start DJ’ing the Evening Dance, with a WCS mix. During the first two hours of the evening, Bruce will mix in a little waltz, and foxtrot/swing crossovers for those ballroom dancers that want to get some dances in. We will also sprinkle classic hustle, salsa, country two-step and more over the course of the evening. Admission to the dance is $13.00* per person and DOES NOT INCLUDE THE WORKSHOP! The cost for admission to the workshop is $20.00 per person. We will also have some additional out of town guests coming to Goldcoast that night from the Champions at Sea Cruise! Be sure to join us for an awesome night of music and dancing here at Goldcoast Ballroom! Along with hot coffee or tea — all for only $4.00!! Join us for our popular Friday Nights at Goldcoast Ballroom. A great, fun, and exciting way to kick back and kick off your weekend!